Hunting Turkeys, Eating Turkeys, and Exchanging Turkey Parts For Rewards…There Are Much Much More! Marina del Rey, California - November 15, 2012 - Gravity Interactive, a publisher of exciting massive multiplayer online role-playing games (MMORPGs), is giving players a little something to be thankful for. Ragnarok Online, Rose Online, Requiem: Memento Mori, Dragon Saga and Maestia: Rise of Keledus will all be having their Thanksgiving Sales and events earlier than usual. Make sure to check out all the sales and events starting this Tuesday! This is a great time to explore these games! Paying for subscriptions with a credit card is definitely fast and easy. WarpPortal is offering you can get up to 10% Bonus WP Energy more with limited time! More details can be found at http://www.warpportal.com/news/events.aspx?#437. We are also having a Point Conversion Event for Thanksgiving. There will be a bonus applied to all experience the following week. Players will get bonus points for their WarpPortal energy, it’s beginning Wednesday, November 21st to Tuesday, November 27th! For more information about rules and rewards for all these activities, please head over to the website at www.warpportal.com, and also check out the forum post for the rest of the details as well! Ragnarok: Classic Classes Get Extended! It’s about time to talk about Ninja, Tae Kwon Kid, Gunslinger and Soul Linker classes! Marina Del Rey, California – November 8, 2012 - Gravity Interactive, a publisher of exciting massive multiplayer online role-playing games (MMORPGs), today has emerged to Ragnarok Online, talk the spotlight for latest class reveal on Classic Server. These extended class characters bring unique mechanics the world of Rune Midgard with unique class roles, weapons and skills. Now players can play with their latest classes by visiting http://www.playragnarok.com/news/updatedetail.aspx?id=215&p=1. A versatile ranged class, this gun-toting class can equip and build skills depending on how you want to play. Able to attack by melee or with ranged or even magic attacks this class can use it's unpredictability to its advantage to confuse and destroy their enemies. Look for the latest update and join now at the Ragnarok Portal , or follow the official Facebook at http://www.facebook.com/playragnarok for more information. Maestia: Players can't stop dancing - it's MAEstyle! PLAYERS CAN'T STOP DANCING – IT'S MAESTYLE! The dance that has swept the nation has finally come to Maestia! Marina del Rey, CA – October 25, 2012 –Gravity Interactive, a publisher of exciting massive multiplayer online role-playing games (MMORPGs), has debuted its latest dance move, “MAEstyle”. From Thursday, October 18, Maestia hopes to rally as many players as possible to simultaneously perform the MAEstyle dance. Maestia fans are now in frenzy! Even the GMs are getting down to business with the latest dance, which players can see in this crazy launch trailer: http://www.youtube.com/watch?v=-ECjIJxNk8Q. Using in-game footage and the hit song, “Gangnam Style” by Psy, create and submit a music video on the Facebook page. Players will vote for the Top 5 videos, and the Maestia team will pick the top three videos to give away total of $1,000 in cash and much more! There are also new items introduced with this event including: new mounts, a whole new dungeon and heaps of new events that never leave a dull moment for the players. The best part about it - It’s free! With the amazing “Play with MAEstyle” event, expect the community to be dancing non-stop! There will never be a mundane moment in Maestia, dancing with friends, and create your own video to win some cash prizes! More event details are available at Maestia Portal, and follow the official Facebook page at http://www.facebook.com/playmaestia or Twitter at @PlayMaestia. Adorable Anime-Style MMO Available Now on Steam! Marina del Rey, CA – October 24, 2012 - Gravity Interactive, a publisher of exciting massive multiplayer online role-playing games (MMORPGs), has announced that its popular anime MMORPG, ROSE Online, is now available on Valve’s leading online gaming platform for free! Now players can play ROSE Online by visiting http://store.steampowered.com/app/215120/ and signing up to join the ROSE community on Steam. ROSE Online is a free-roaming MMORPG featuring anime inspired graphics where players will mostly fight cute and humorous monsters. During the early levels players will beat on walking, talking Jelly Beans and even fighting small woodland creatures, along the journey players will be able to participate in Player vs. Player. Players are able to customize their characters stats and skills to play through the story line as they wish. Players will connect with millions of players and have instant access to ROSE Online and in-game events through Steam. To download and play ROSE Online from Steam, go to: http://store.steampowered.com/app/215120/. Players can get all the latest information from the official ROSE Online Facebook at http://www.facebook.com/playrose as well as get a chance to see constant updates on Community Events! ROSE Online is a free-roaming MMORPG featuring anime inspired graphics and the cutest game environment players have ever seen! Jump in and fight monsters, level up, gain new skills, and find magical equipment to prepare for challenging future battles. Travel to different planets, exploring new enviroments, and battle other players. Gain experience both by killing monsters as well as completing quests, which weave together a story that reaches across the stars. Completing quests is also a great way to receive rewards, but beware: some quests have a time limit and must be completed promptly for the best prizes. Join with fellow players to create Clans, then declare war against other clans for fun filled battles! With an in-game economy controlled directly by the players, supply and demand can change every day: it's up to you to seize the economic opportunities while they last. ROSE Online: Full Steam Ahead! The Bright, Anime Styled MMO is Joining the Steam Roster! Marina Del Rey, CA – October 18, 2012 - Gravity Interactive, a publisher of exciting massive multiplayer online role-playing games (MMORPGs), has announced that its popular fantasy MMORPG, ROSE Online, is coming soon to Steam, the revolutionary gaming platform developed by Valve. Soon users will be able to join the vibrant world and bustling community of ROSE Online through the Steam client. ROSE Online is a Free-to-Play MMORPG that combines a distinct, vibrant art style with unique take on many classic MMO features. The numerous worlds of ROSE will take players from lush jungles to frozen fortresses to burning deserts. Players can traverse these worlds by driving customizable carts, riding a wide variety of mounts, or even donning the legendary Castle Gear. These iconic mechs made of wood and steel are truly a sight to behold, and help set ROSE apart from other MMORPGs. "We are very excited to bring ROSE Online to the Steam community," said Mike Lansing, Executive Director at Gravity Interactive. "As gamers, we are big fans of Steam, and working with Valve has been great. We can't wait to see ROSE Online join the list of games offered by Steam. The Steam community is in for a real treat, as they are about to join an amazing community full of players from across the world on an adventure like no other. Keep watching Steam by visiting http://store.steampowered.com/app/215120 as ROSE Online will soon be available for download. You can also follow the official ROSE Online Facebook at http://www.facebook.com/playrose to stay up-to-date on new updates and events! TREATS PLAYERS TO FRIGHT EXTRAVAGANZA! Don’t Miss Out, Tricking and Treating Until November 7th! Marina del Rey, California - October 12, 2012 - Gravity Interactive, a publisher of exciting massive multiplayer online role-playing games (MMORPGs), invites players and fans alike to participate in spooky celebrations in all of WarpPortal’s games such as: Ragnarok Online, Rose Online, Requiem: Memento Mori, Dragon Saga and Maestia: Rise of Keledus. From October 16 through November 7, 2012, players will be tricked or treated to in-game Halloween events, activities and fabulous items. 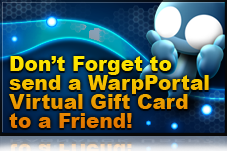 For more information about rules and rewards for all these activities, please head over to the website at www.warpportal.com.